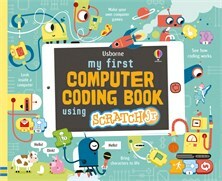 Click on the links to get started with ScratchJr and to find out more about coding and computers, free apps, tips on screen time and online safety for children. Click on the numbers to find out what the icons do or click on "Tips & Hints" in the top menu for more information. On your tablet, scroll down to find the app store for your device. Click on the play button. Thousands of activities for kids ages two to six. Read about the games, then search for them on your app store. A storytelling tool to draw, animate, narrate and record your own cartoons. Cbeebies, from the BBC, may not be available where you are due to copyright restrictions. NB Not all products are free. Filter the selection by choosing an age range next to "All ages". Choose a topic then use the filter menu to search by age, price and other details. Scratch is similar to ScratchJr but has more blocks. It's free and works on all devices. Click on "Try it out" then on the next screen, click on "Begin". Find helpful advice about how to set up a Scratch account and lots of other tips and resources. What would you do if you got a message from someone you didn't know? Try quizzes and activities after you watch the clip. For a test-yourself quiz, click on "What Kind of Screen Time Parent Are You?" For a clip on internet safety for children aged 6 to 10, click on the playlist. A fun, friendly guide to coding on a tablet computer using the free ScratchJR app. Discover how computers work and how to tell them what to do using code, then follow simple, step-by-step instructions to code stories and games including a fairy garden, a pet monster and a space game. Links to websites and helpful notes for grown-ups included!